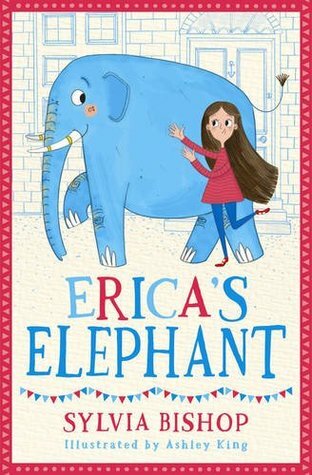 The Elephant was on Erica's doorstep on the morning of her tenth birthday. There was also a piece of paper stating that she, Erica Perkins, had a Legal Right to the Elephant. "But it's all very well," said Erica," fussing about whether I have a Right to the Elephant. The Elephant has been Left to me, and that seems to be the bigger problem." hen Erica Perkins wakes up on the morning of her tenth birthday, the last thing she expects is to find a very confused elephant sitting on her doorstep. So begins an unlikely friendship. But can a small girl and a rather large elephant learn to live together in a tiny terraced house? And when the dastardly owner of the local zoo plots to steal the elephant, will Erica be able to outsmart him? What a delightfully Dahlesque tale! I can't believe how much I enjoyed it. I had to stop myself from reading it again. It's one of those huggy books that you love so much you want to keep forever. I loved the relationship between Erica and the Elephant. Erica has to be the most caring ten year old, ever. She was willing to do what ever she could to make the Elephant happy, even if it made her sad. She understood exactly how the Elephant felt, just by learning his body language and the way he tronked. I love the quirkiness and absurdity of the tale that makes it so wonderful, charming and believable. The illustrations complemented the book perfectly. The red, white and blue colour scheme really make the cover stand out. Every child will delight at this classical tale that breathes hints of children's literature long forgotten. A lovely children’s book about the friendship between a girl and an elephant that will put a smile on anyone’s face. Brilliant!